Back in February, Facebook CEO Mark Zuckerberg fired off a long e-mail to his staff that outlined the platform's new mission in video: to maximize live-streaming. Facebook Live was launched in August last year, in response the growing hype around live-streaming apps Meerkat and Periscope. Live was initially made available to celebrities only, but by December The Social Network had made the option available to all users. And it was gaining momentum fast. The first major move as a result of this new emphasis came in April, when Facebook rolled out a whole range of new options for Live, including on screen 'Reactions' which bounce across the screen as you broadcast to show you how viewers are responding to your content, live filters to help customize your stream, and a new dedicated place within the Facebook app to help users discover Live content - with prominent placement right in the middle of the bottom bar. And while all of these are impressive and significant additions in themselves, they largely mirror the functionalities available in other video apps - there's nothing ground-breaking about these features, it's just that Facebook now has them as well. But now, Facebook's moving to accelerate ahead of the pack, with the addition of a new, unique feature that could have a significant impact on how you consume, and even create, Live content. As per TechCrunch, Facebook is rolling out new feature that'll show you the collective responses to a Live video on a graph, which will appear whenever you go to fast-forward a replay. As you can see in the above screenshot, the graph shows peaks in Reaction levels throughout the video - the chart is an accumulation of Reactions and comments made during the stream. 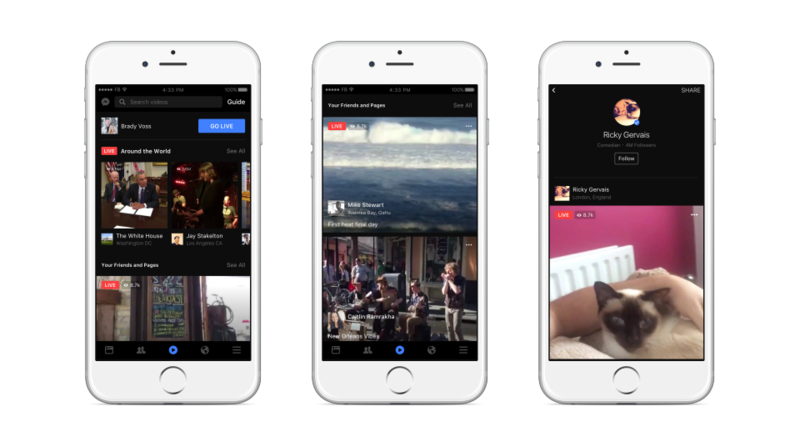 From this, the viewer will be able to skip to the parts of most interest, which is another way for Facebook to help filter the noise of live-streaming content and help users experience the best of what Live has to offer. In a recent blog post by Meerkat's founder Ben Rubin, in which he announced the company's decision to pivot away from live-streaming in response to the increased competition in the space from Periscope and Facebook, Rubin noted that all live-stream platforms are struggling to create repeat broadcasters at a growing rate, while audience growth is also hard to maintain due to the varying levels of broadcast quality. "One thing we have learned is there is a very high emotional cost to being entertaining in a live format, and bringing on enough of a live audience to make it worthwhile is challenging too." Essentially, what Rubin and Meerkat found was that live content is hard, and most people don't know how to do it well. Indeed, research has shown that only a small proportion (3%) of Periscope's user-base are actually creating and broadcasting content, while the vast majority are purely watchers. Which is fine, not everyone's going to be great at Live, but it poses a growth issue on two fronts. If live-streaming, as a function, is entertaining, something that's fun to do, then it can grow through user adoption. But if it's not - and, as noted, the stats show that most people aren't comfortable with actually broadcasting themselves live - then you can't rely on functionality to fuel growth and adoption of the option, which means instead you need to rely on the content. And that means you need to help viewers find the most entertaining content in order to keep them around. If the focus is on entertainment, then you need a way to filter the noise - there are hundreds of live-streams happening at any given moment, but because much of it is low quality (which is subjective, of course) it makes it harder to get a significant audience to embrace and adopt live-streaming. If every time people go to check out live broadcasts it's all self-help gurus and people spouting random monologues, they're not likely to stick around, which goes back to the audience growth issue noted by Rubin. On the first problem, all live-stream platforms have been working to overcome the signal-to-noise issues - group live-streaming app Blab, for example, has worked to make the user experience more personalized with content and broadcaster recommendations more attuned to each person's individual preferences and usage, as opposed to showing you a complete list of all content being broadcast at any moment (though Blab, itself, may be looking to pivot slightly, according to latest reports). Facebook's sought to address this issue by adding in the aforementioned video tab which highlights Live videos "that the world is talking about, from the friends and creators that matter most to you, and on the topics you're interested in". Essentially, Facebook's able to use what it knows about you from its understanding of your connections and interests to show you a more focussed and individually aligned Live video feed, which will ultimately help them provide a better Live experience. And on the second issue, Facebook's put a big focus on celebrity and high profile creator content to get more Live video of mass appeal on their platform and draw more viewers to the option. 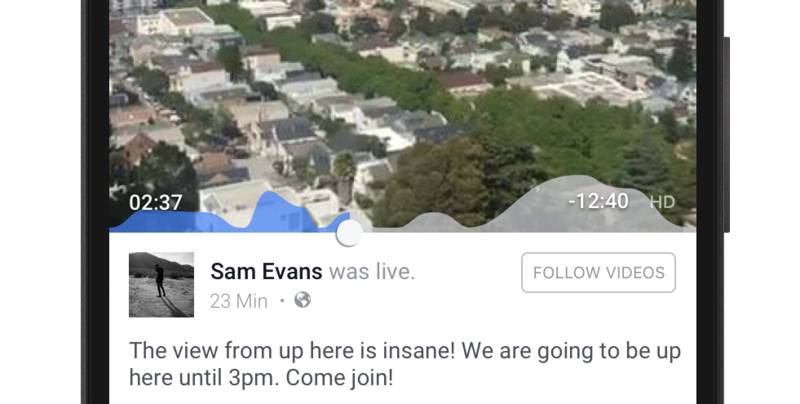 Facebook's also working on additional tools to help highlight more popular material - last week they released a new addition to their Live map feature with the most popular Live streams happening at any given time highlighted on the left, again directing users towards higher quality, more entertaining content. The addition of a graph which measures in broadcast audience response is another innovative and intelligent way to help users filter the noise and get the most out of Live content. And while a graph of responses can only be added after the fact (you obviously can't fast-forward a Live stream), according to Facebook around two-thirds of the watch time for Facebook Live happens after the initial broadcast. This may be best exemplified by the latest viral video - Texas woman Candace Payne trying out her new toy Chewbacca mask. That video's now nearing 138 million views, but only a tiny, tiny fraction of those views would have come from the initial stream (Payne's other Live videos average around 1k views). The Chewbacca video also only picks up momentum after the 2 min mark when Payne puts on the mask, something that the new graph option would highlight straight away, making it easier for viewers to skip through and catch the best bits. Facebook's hope, other than making it a better experience for viewers, is to also make it more welcoming for creators - according to Facebook's head of video Fidji Simo, a graph showing the peaks could take the pressure off creators by enabling them to worry less about boring their viewers. If you don't want to wait through the boring bits, you don't have to, just skip forward to the next response peak. It' a clever option which uses the data Facebook has on Live content to best effect, and has the potential change the way we view video such broadcasts, likely boosting consumption rates. The practice of live-streaming fits perfectly into Zuckerberg's vision for Facebook, supporting its mission to 'connect the world'. What's more connective than the immediacy of live video - being able to see another perspective on the world, maybe a stranger on the other side of the planet, live and real-time? Through Live, you can experience events in a whole new way, you can get a glimpse of how other cultures live. It provides a whole new depth of insight into the wider world. The big challenge is in getting people across, in making Live a genuine, mainstream option, a channel people will switch to for entertainment, just like they would on their regular TV. And given these latest advances, along with Facebook's work on integrating Facebook with your home TV unit, that may become a reality sooner than you'd think. If Facebook can showcase the best, most relevant streams to users and effectively filter out the noise, it may be on track to make Live a much bigger deal than it already is.